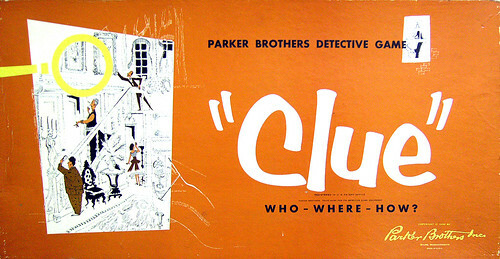 In 1949, a solicitor’s clerk in Birmingham, Anthony Pratt, sold the rights to “Murder,” a board game he had invented, to English publisher Waddington’s, which in turn licensed North American rights to Parker Bros. Later that year, the two companies introduced, respectively, Cluedo and Clue…. since when, tens of millions of people around the world have struggled to deduce who killed poor, perpetually-murdered Mr. Black (or “Mr. Boddy” in North American versions)– and have read the children’s books, played the video and iPod/iPhone games, put together the jig saw puzzles, and seen the television games shows, the Broadway musical, and the feature film all based on the game. Readers can trace the evolution of the game here (from whence, the images above) or here, and can discover the (surprisingly complex) back-stories of the characters here. 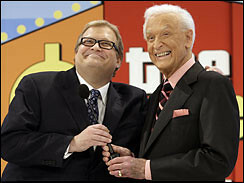 As we adjust our deerstalkers, we might recall that it was on this date in 2007 that the continuity of America’s longest-running television game show, The Price Is Right, was maintained, as Bob Barker passed the microphone to Drew Carey. Barker had taken over in 1972 from founding host Bill Cullen, who premiered the show in 1956.